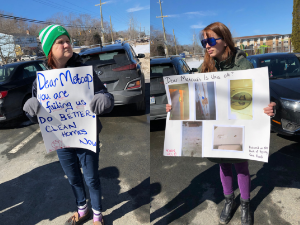 On Wednesday, March 13th, ACORN members from Spryfield met at the 500 block of Herring Cove Road to stage a tenant action against MetCap. Members were there to request a meeting with MetCap’s management team, present a letter of demands and deliver a poster showing MetCap some of the poor conditions in their buildings. 1. Repairs – members demand that MetCap begins to do these in a timely manner and allocate the tasks to professional staff members. 3. Health – it is time that MetCap takes tenants' health seriously. Tenants live in buildings with black mould, bed bugs, and cockroaches. Little action is taken when these are reported. Black mould is painted over, and bed bug infestations are not dealt with efficiently. Members demand that MetCap deals with these issues as soon as possible. 4. Safety – MetCap needs to shovel emergency exits after huge storms and ensure every unit has working smoke detectors. Currently, several units do not have smoke detectors and emergency exits are constantly blocked after snowy days. Unfortunately, upon arrival at the MetCap office, members were met with great hostility from the on-duty staff member. The staff member removed the letter from the envelope, a sure sign to the members that the letter would not be getting delivered. The Metcap staff member continued to be unfriendly and locked ACORN members out of the office. They even called the police! Despite this hostile reception, members were not disheartened. They felt that this was the push they needed to fight even harder for healthy homes. When checking in with leaders after this action, they indicated that the next steps include contacting the MetCap head office and planning to contact building inspectors. Overall, members left feeling more determined than ever to continue their fight for healthy homes.